I love County Living Magzine. And I love architecture...and houses...and renovations. And I love it even MORE when the two worlds collide and Country Living showcases a few homes around the US that are for sale! I look forward to the "real estate sampler", as they call it, each and every month. But in all the years I have been a subscriber, I have never actually gone further and checked out one of these houses. I do wonder how in the heck these big old houses sometimes come with such tiny price tags. This one caught my eye this month, so for the first time I decided to check out the realtor's website and get the scoop on this old beauty. That is where I stumbled on these pics...and fell in love. I think I am packin' my bags and heading South! 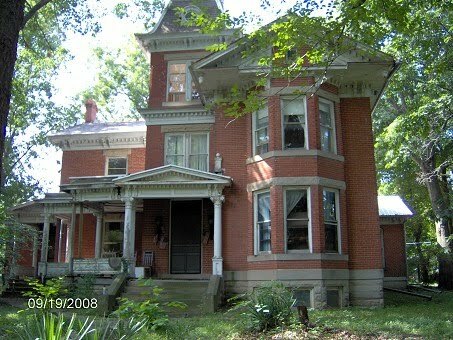 This lovely Antebellum home is in Brunswick, Missouri and is on the market for only $99,000. Around here...that would be a steal! It has 4,400 square feet with a smoke-house and a barn...and sits on 2.6 acres. It has 6 chimneys and a widow's walk. I think I just may pass out. $99,000?? Really?? It is my dream to live here. I just hope I would also find the closets stuffed with the cash I would need to fund the enormous renovation this old girl needs! Just look at her. So majestic. So beautiful. So in need of a little TLC. Look at that profile...gorgeous! I think for the rest of this post, I am going to dream that she is mine. She could be so much more than she is right now. Ok, so the trim needs a little "work done"...a little nip...a little tuck...nothing I can't handle. 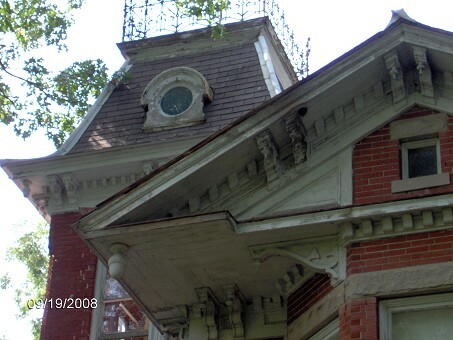 Here is my trim-repair tip of the day...for those of you working on an old house...get a pen and paper...I'll wait. Use Bondo to repair the wood. It is magic in a can, I swear. Oh, and if you don't know what Bondo is, visit your friendly neighborhood auto-body shop. It is what they use on rusted out old cars when they are restoring the body. Works magic on old rotten wood so you don't have to replace it. So lets start the inside tour. It only took me about 20 seconds to reno this home in my head. I am crazy-obsessed with this foyer. 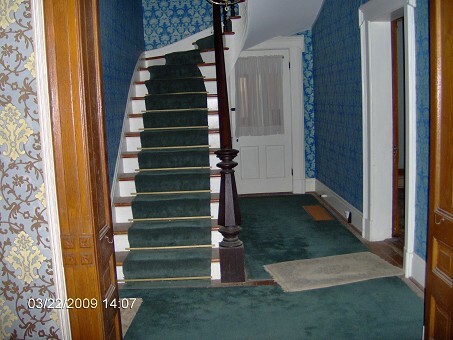 I have dreams of refinishing the hardwood floors and painting all the trim and bannister white. I would love to take down the wallpaper, give the walls fresh paint and a lovely jute runner up the stairs. Oh, and of course a vintage chandelier needs to live here, too. Now, the next picture is a bad one...so look very close. See the middle of the photo? 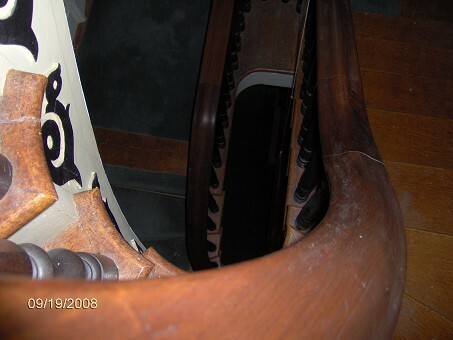 That gorgeous curving staircase winds up to a third story and you can see all the way down the middle to the first floor. 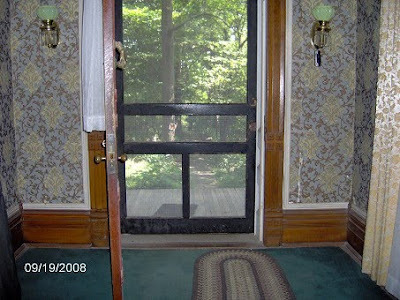 I love the sound of a slamming screen door. And check out how wide this one is. And yes, that wallpaper and those sconces would have to go. A couple of lovely vintage metal and crytal ones would suit me nicely. Oh, and of couse more white woodwork. I can't live without natural light. It is essential to my being. These floor to ceiling windows would make me a happy girl! Oooh...that mantel! 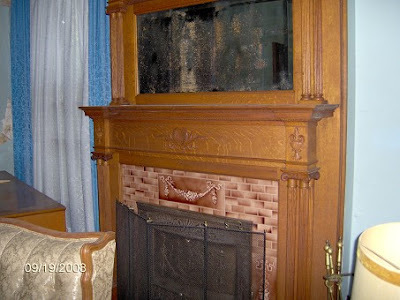 This house has 3 fireplaces, all with hand-carved, large mantels. They are all begging for fresh white paint...but I have to leave that old mirror just like it is. Have I ever told you how much I like weathered mirrors? I saved my favorite for last...I have no idea what this little shed is currently used for...maybe this is the old smokehouse...but I see my office here. A perfect little get-away. A new window. A new roof. A pretty paint color with white trim. I would wake up early just so I could get out there and do some work! Ok, I am back to reality. Back to my house built in the 50s. Back to 8' ceilings and a 2 car attached garage. A long way from my Antebellum fantasy...but I have to admit, it was so nice to dream. look like this one though--I like this one. Ahhh...wouldn't that be wonderful! Thank you for the tour! Before moving up to the mountains almost 10 years ago, finding a cool old place down south was definitely on the list of considerations. You sure can't beat those prices! There was one thing I thought though...your dream house did remind me a bit of this when I first saw the exterior...and maybe why it's still on the market! OMG! It's a beauty! I'm so glad you got to see it. And that price... wow. We have a house in our town that is similar in size/price. I've been dreaming of her for years. 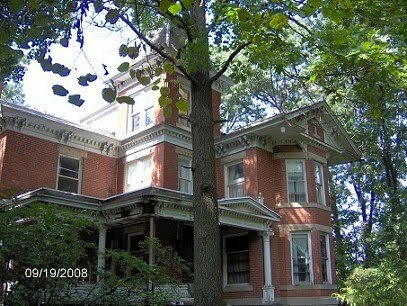 I am freaking out over that house!!! That house is spectacular! 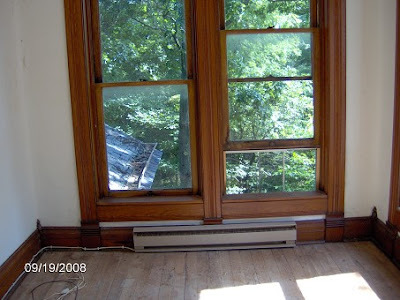 I too want to move with you - white woodwork, weathered mirrors, chandeliers - oh my - I could do it! Love-Love-Love it! And you're right - that little cabin/shed is the icing on the cake! WOW! Definitely a gorgeous house Mary!!! Soooooo much potential there...and you're just the girl to give her a redo! 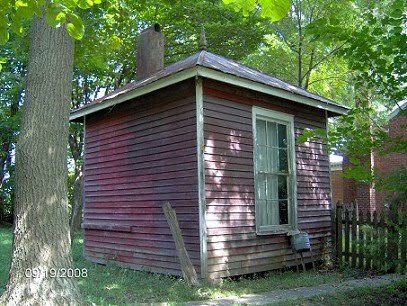 I think the little cottage out back would be a perfect place for me to crash during renovations....this House would be a dream to see lovingly restored!! And yes the price is a steal!!! That house is just screaming out for someone to come and love her......wish I could join in on that reno, what a beauty!!!! I agree a total steal!!! Gorgeous, you have great ideas! Such a cute blog lady. Love it! So, so, so... can't find the words. I even love the funky wallpaper. Wonder what she needs? I'm so glad I found your blog...your write about all the things I love. BTW, that house is just a few miles from where I live. I too, love the Real Estate Sampler from Country Living Mag and I saw this home in that issue too. Guess I'll have to keep my 1968 rancher too...but we can dream can't we?